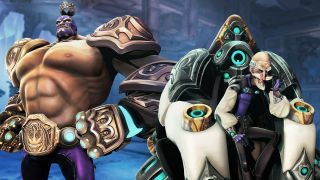 The final two heroes to join Gearbox's Battleborn lineup have been revealed as a mad scientist in a hovering chair named Kleese, and a “space luchador with cybernetic arms” who calls himself El Dragón. See it at the weekender! Check out Battleborn at the PC Gamer Weekender in London from March 5-6. Click here to find out more. Gearbox said Kleese and El Dragón are the most “absolutely absurd” heroes in Battleborn, but aside from that and a reliance on Last Light Consortium technology, they have virtually nothing in common. Kleese's combat abilities are dependent almost entirely upon his chair, which is really sort of a very comfortable floating tank, armed with a shock taser, energy mortar, a black hole generator, and an energy rift shield projector. As you can see from the gameplay trailer below, Kleese is big on riding in style, and staying as far as he can from potential trouble. El Dragón is more of a hands-on kind of guy, which is amusing because his hands, along with the rest of his arms, were ripped out in a battle for the strap against a rogue AI. His new-and-improved arms give him abilities like the Clothesline, the Dragon Splash, and the En Fuego finisher. He may have been hideously maimed in his last fight but he still thinks he's the Undisputed Champ, which also happens to be an ability that makes him more powerful with each successive kill. Battleborn will be on display at the PC Gamer Weekender, which begins—gasp!—tomorrow and runs through March 6. It (the game, not the Weekender) is scheduled to come out May 3.